On May 6, 2012, as I turned the corner to finish the final 0.1 mile of my first half-marathon, I looked for my dad among the screaming spectators. Crossing that finish line was the culmination of four months of cathartic pounding of the pavement, each step simultaneously exorcising the demons of an abusive relationship and rebuilding my shattered confidence. Something seemed different when I looked over and saw him, but I couldn’t put my finger on it and I had a finish line to cross. My dad, a former recreational runner who was struggling with alcoholism and depression as a result of a contentious divorce, had been my rock throughout the training process. Something seemed different when I looked over and saw him, but I couldn’t put my finger on it and I had a finish line to cross. I collected my medal and went to find him, but I was unable to. When I finally did, he was grasping onto trees to help steady himself because he could barely walk. He was just tired, he said. Let’s get our picture and go home. I gleefully recounted the details of the race; I had set a goal, done the work, and achieved it. But my dad could barely drive us home. Once we got there, his older sister insisted upon a trip to urgent care. The doctor sent us straight to the hospital, and my dad was admitted right away. I failed to grasp the seriousness of the matter and sat outside wearing my medal and eating a burger while he got examined. I came back in the room and suddenly his eyes rolled back and machines started beeping. Nurses ran in and kicked us out. The ER doctor and chaplain found me some time after. Multi-system organ failure. Pulmonary embolism. Life support. The words shook me back to reality. Within hours of finding myself on top of the world, the person who had been by my side for everything was leaving it. Was I too focused on building myself back up that I failed to notice the depths of his intense downward spiral? The agonizing guilt gnawed at me and incapacitated me to the point where I could not speak coherently or move without collapsing. If I had not signed up for the race, would he still be alive? Heartbroken, I made the decision to remove him from life support. I told him that it was okay to let go, and he was pronounced dead at 2:16 a.m. I was still wearing my medal as I walked out of the hospital. As the cards, food deliveries, and sympathy posts faded away, people returned to their lives and it was just me, alone with my guilt, grief, and a wide range of other emotions. I couldn’t think clearly enough to make decisions or go back to work, but I had the physical strength to punch walls and the sharpness of tongue to lash out. I needed something to give me a purpose during a time when I felt like I had none. I thought back to how it felt to have May 6 circled on the calendar, when I was first starting to crawl out of my traumatized shell. Having that date circled meant that I had a reason to be here, that I had a reason to wake up every morning and make decisions that were going to help me move closer to my goal. These steps were painful and heavy, but they were steps forward. I was 23 years old and had always looked to my dad for reinforcement that the steps I was taking were ones in the right direction. Now I had no one but myself to provide this confirmation. I took a deep breath and circled October 21, 2012, on the calendar. I was going to run a full marathon—13.1 miles for me, 13.1 miles for him. I had his signature tattooed on my foot so that he could run with me. I woke up the next morning and laced up my shoes. I slowly walked out the door and took my first steps toward my new goal. These steps were painful and heavy, but they were steps forward. These steps enabled me to unleash my emotions in a healthier way. I slowly stopped punching walls, because at least my shoes provided cushion when I clomped on the pavement. Walls were unforgiving. People tell you to be strong, and some days making the decision to go for a run instead of doing something self-destructive is my definition of strong. 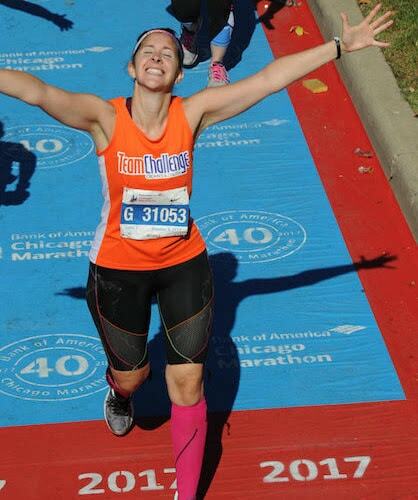 I crossed my first full-marathon finish line on October 21, 2012, and have continued to use long-distance running as a form of therapy, empowerment, and purpose. Six years and 11 full marathons later, I am not immune to overwhelming moments where the grief renders me motionless. I’m not sure that I ever will be. But the dates circled on my calendar remind me that I have a purpose. My medals displayed on the wall represent resilience and endurance. I remind myself that I can always take one more step, even when I don’t think it is possible. Those steps will add up. And slowly, my mind begins to believe it.